Learning about this Copycat Hidden Valley Mix has been one of the highlights of my cooking career.My family LOVES this stuff! Blend in food processor or blender and store in airtght container. When recipe calls for 1 packet of mix, use 2 tbsp of this instead. 16 Servings 3 tbsp dressing mix,1 cup milk, 1 cup mayonnaise. 3. Prepared Hidden Valley Ranch Dressing stays fresh 3-4 weeks. Dip Directions: Mix 3 tbsp of Hidden Valley Mix with 16oz sour cream. You’re welcome! I am excited to try out the recipe! 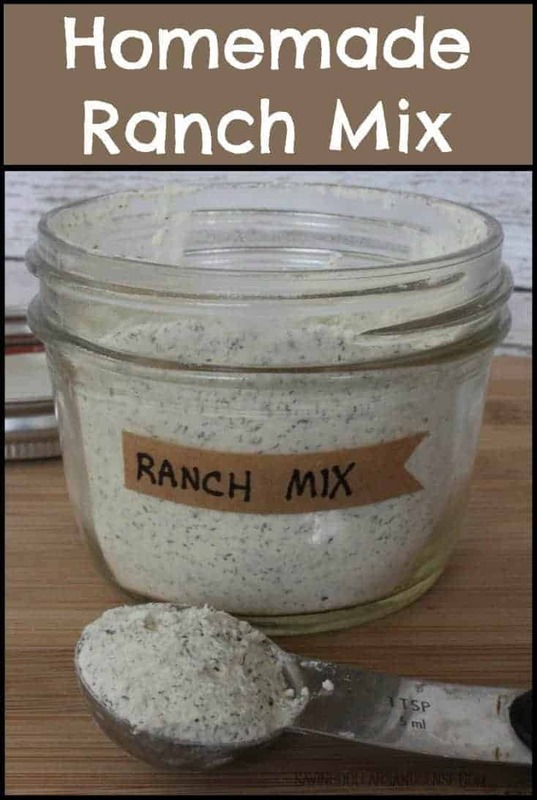 We literally go through gallons of ranch per year in my house it seems so this would help me out a lot! Is it ok if we use the graphic to include with the link back to your site? Oh, yes go right ahead. Thanks again! It’s a powder that doesn’t need to be refrigerated. I’m sure you could just substitute it. I just made this and it tastes delicious! I used the directions to make 8 servings of salad dressing and it is too watery. Is there a suggestion you have to thicken it? I haven’t refrigerated it yet, maybe that might help?? My whole reason to make from scratch is to avoid the MSG in Hidden Valley Ranch, so why use something that is almost all (Accent) MSG in this? I agree. I’m allergic to MSG. It gives me a royal headache. The reason I would want to make ranch dressing from scratch is to avoid using/eating MSG. Does this make a big difference in taste? If so, what would you recommend as an MSG substitute? Thanks. Can you use dry milk? I don’t have dry buttermilk. It’s worth a try. Let me know how it works out for you. I like to use small curd low fat cottage cheese. Blend it with the spices in the bullet, taste the same and you just cut 99% of the fat and calories! Can I substitute buttermilk for milk and not use the dry buttermilk in the mix? Would this be good if you use buttermilk instead of milk? Also, would it be possible to make it with dried buttermilk? I would love to make this up and have on hand! Love the fact that MSG is optional (MSG allergy). Thanks! I haven’t tried buttermilk myself, but I bet it would work! !